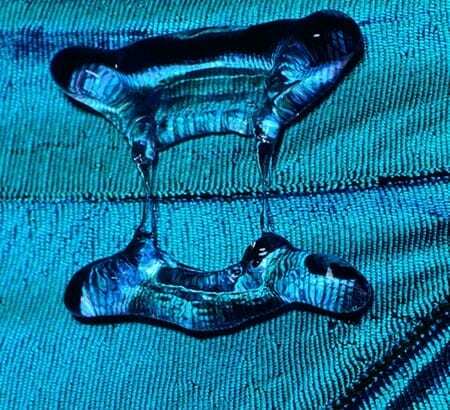 Scientists may have just created the most water-resistant artificial material in the world. A surface’s texture makes all the difference when it comes to water resistance. Ridged, veined surfaces — like the wings of a butterfly — cause drops to break into irregular shapes, dramatically reducing their contact time. This finding could lead to new technologies for anything that involves dynamic interactions of liquids onto solids — such as wind turbines or flying robots. Many of those who study hydrophobic materials — water-repellant surfaces in both nature and laboratories — had found themselves at an impasse with a theoretical limit on the amount of time it takes for water to rebound from a surface. However, a team of researchers have achieved a breakthrough: They found a way to reduce a water droplet’s contact time with a surface by 40 percent or more. The researchers — Kripa Varanasi, Doherty associate professor of mechanical engineering at Massachusetts Institute of Technology; James Bird, assistant professor of mechanical engineering at Boston University; former MIT postdoc Rajeev Dhiman; and MIT PhD recipient Hyuk-Min Kwon — reported their findings in the journal Nature. The theorized limit of the minimum time a drop stays in contact with a surface is based on the time frame of oscillations in a drop. It was previously believed that minimizing interaction between the water and surface was the key to achieving the theoretical minimum contact time. The thinking was that water rebounded fastest when hitting a smooth surface in a symmetrical shape. However, the MIT team found that increasing surface interaction time in a certain way could lower contact time beyond that theoretical limit. By adding macroscopic features like ridges that split droplets, the scientists were able to cause the water to rebound in uneven, irregular shapes and reduce contact times by 40 percent. The breakthrough could have tangible applications in critical environments — possibly to prevent ice buildup on aircraft by repelling rain before it had a chance to freeze. The researchers showed in findings that the droplets bounced off the modified surfaces before freezing, where they would solidify on control surfaces. The team believes that the contact time can be lowered still, to a 70-80 percent reduction on the original limit, by optimizing the ridged texture. The ridges used in the surface textures can be created using regular milling tools. “We showed the effect with simple ridges, but we could think of other macroscopic geometries as well,” MIT’s Varanasi told TechNewsWorld. “Perhaps the most straightforward [way to further reduce contact time] would be to design the texture to fracture the drop into more pieces,” Boston University’s James Bird told TechNewsWorld. While conducting the research, the team found a number of surfaces could replicate the uneven breakup of droplets, as long as the ridges were of the correct scale. Some butterfly wings, for instance, replicate the effect, allowing the creatures to avoid water clogging down their aerodynamic capabilities and effectively improving their chances of survival. Veins in wings act as the water-breaking ridges for the butterflies. Likewise, the leaves of plants in the nasturtium genus have veins on top of their leaves, which break up drops. April 10, 2019 - IIT Mandi Researchers Turn Hydrophobic Carbon Materials To Hydrophilic High-Performance Supercapacitors BW BusinessworldBW Education - , Professional Education-Vertically aligned carbon nanotubes allow a 102-fold increase in energy density. April 17, 2019 - New study Global Hydrophobic Agent Market 2019 | Growth Opportunities, Investment Feasibility, Market Share And Forecast 2024 Market Research GazetteGlobal Hydrophobic Agent Market Research Report offers complete knowledge, forecast and statistical analysis on past, present and forecast industry situations. April 12, 2019 - New from Sea Otter: Giant Charge Pro and Giant Shuttle Flat shoes Canadian Cycling MagazineWhether you ride flats or race cross country, the Taiwan-base company has a new shoe for you with its Giant Charge Pro and Giant Shuttle Flat.